Iko Uwais wowed audiences with his martial arts prowess in the two Raid films (it even earned him a cameo in Star Wars: The Force Awakens). 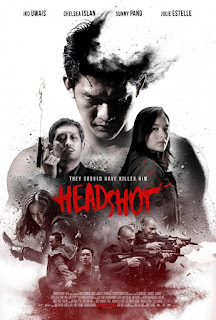 His follow up, Headshot, brings back a handful of recognizable faces from The Raid 2 and, if it’s possible, amps up the gruesome violence. To be fair, the Raid films were extremely violent (though the second added some badly needed story along with it), but they were still less bloody than Headshot. This is the kind of movie where 20-30 people die before the opening scene ends. It’s the kind of action movie where the bad guys shoot to kill early and often except for whenever it’s one of the main characters they’re pointing the gun at. It’s the kind of martial arts film where both the good guys and the bad guys respect an unspoken code among fighters enough to drop their guns in favor of hand to hand combat. Or is it that they’re all deranged enough to want to kill each other with their bare hands? Furthermore, it’s the kind of film where the bad guys only take prisoners when it’s the girlfriend of the main hero, and they only keep her around to give the hero a reason to come kill them. Yes, in some ways it’s held back by a few too many action movie tropes, but what it lacks in originality it makes up for with cleverly staged and precisely performed action sequences. All the action was choreographed by Uwais and his team, and it’s every bit as brutal as The Raid. Uwais, may just be leading a martial arts renaissance with a concentration on gritty gangster stories. His action is every bit as cleverly staged and crafted as the work of Jackie Chan and every bit as bloody as the work of Quentin Tarantino. However, though they’re very different filmmakers, there’s a comedic playfulness to the work of Chan and Tarantino wholly absent from Uwais’s films. Instead, his brand of martial arts action takes on a far more serious tone, set in a seedy, dirty, grimy criminal underworld in Jakarta, Indonesia. And considering how underwhelming Jackie Chan’s films have been of late, and just how beloved The Raid films have been, it’s not hard to imagine Uwais being the inspiration for a new generation of martial arts filmmakers. Headshot, as the title suggests, begins with the Uwais character laying in a coma after having been shot in the head. His caregiver, attractive young nurse Ailin (Chelsea Islan), is so fascinated by his case that she chooses to stay by his side until he finally wakes up. With his memory gone, she gives him the name Ishmael, and concentrates all her efforts on helping him recover. In fact, the way she sleeps on a couch next to him while he’s recovering and leads him around by the hand, you’d think these two were significant others before the incident. However, the film makes it abundantly clear that their first meeting is when he wakes up. To her credit, Islan plays Ailin with enough charm that she endears herself to us early on despite the short amount of setup she’s given. Nevertheless, as Ishmael recuperates, dangerous crime lord Lee (Sunny Pang) breaks out of prison, gets revenge on a rival gang, and uses his influence to track down Ishmael. It’s about now that we realize this crime lord has a major beef with Ishmael and is responsible for the headshot that started this whole series of events. And, of course, because Ishmael has started to fall for Ailin, she becomes a target for Lee to punish him with. Again, it’s all fairly typical action movie tropes up to this point, but I’ll give writer Timo Tjahjanto (who also co-directed the film along with Kimo Stamboel - their known as “the Mo Brothers”) credit for avoiding making Ailin just a helpless damsel in distress. He does occasionally sideline her in order to give Uwais ample opportunity to stage his compelling action sequences, but that’s likely because of how keenly aware of what sort of movie he’s making. As Ishmael continues to fend off attacks from more and more of Lee’s vicious henchmen, his innate fighting skill continues to emerge, as does his memories. For reasons I won’t spoil here, the circumstances that lead to Ishmael’s near fatal headshot are slowly revealed through flashbacks triggered by run-ins with familiar faces from Lee’s squad of goons. This newfound familiarity with his attackers adds an increasingly deeper emotional layer to each new fight sequence. Many have drawn comparisons to the Bourne films, no doubt for the amnesia stricken central character, but I prefer to think of it as an unofficial origin story for Uwais’s character from The Raid films. It’s obviously not, of course, but Headshot doesn’t stand particularly well on its own. The bad guy, though fairly effectively set up, is rather poorly developed for holding such power over the film and the hero. And the memories Ishmael uncovers are somewhat underdeveloped as well. On the one hand, I can appreciate a film that doesn’t over-explain, but this film doesn’t do quite enough. However, what it does do effectively, it does with a rare precision. It isn’t just the impressive physicality, or the clever use of props and staging, or even the pretty cinematography (and this film is very well shot), it’s often the way Uwais shares his fight scenes with memorable villains just as skilled as he is that takes his films to another level. Sure, he takes down his share of faceless goons, and most of the characters here are a tad underdeveloped, but the real henchmen in an Uwais action film sport a unique look and a devastating fighting style that makes them every bit as interesting to watch as the central character. You certainly remember “Hammer Girl” from The Raid 2 (played by Julie Estelle), she’s back here as a knife wielding killer in one of the best scenes in the film. But maybe the reason Uwais is so effective in his action scenes is because of the vulnerability he allows his characters to have. You really do worry that he’ll make it through each fight against these psychotic killers. Maybe that’s reason enough put him alongside other great martial arts filmmakers that pioneered their own styles and inspired new generations of filmmakers in the process. Blog Update: I Went Back To School! The Office Revival - Where did they end up? Please whitelist this blog in your adblocker.